Ok Gator so I looked up Canadian camo and found somthing called CADPAT it's a type of camo the army used. I seem to recall a dark grern, maybe some black, and broad sand, but nothing official. There could've been 577s at Troop level, I just don't recall seeing them, but again, they would've co-located with the Squadron TOC more than likely. I did the BDUs the hard way, painted the base medium green, then added splotches of black, sand and finally field drab, all model master. I had to go back and clean up some of the bigger patches of color though and it was a pain. Since then, I have had more success by painting the base color, then using a stippling brush to dab on black, sand and field drab in that order. You have to go lightly with the stippling brush though and wipe most of the paint off, almost like a drybrush or you will completely cover the previous colors. I got lost during Desert Shield. We were to displace up the TAPline road to our new assembly areas prior to the war starting. Our advance party consisted of three CUCVs which left with the Squadron advance party, and once they were in place we rolled the remainder of the trains up TAPline. It was supposed to take 12 hours for them to get there so we launched the aircraft about mid afternoon to get there about the same time the trains would. it wasn't a long flight and we stopped at a FOB the 101st set up for fuel and landed about 1600 that afternoon. We checked in with the Squadron jumpTOC on site and discovered that traffic was so bad we couldn't expect to see the trains until the following afternoon. So we set up a squadron coil with the attack troop gunships facing Iraq and the air and lift troops filling in around the circle. So we have about 72 aircraft spread out in a circle about 3 km in diameter. At this time we were about 10 kms from the iraqi border with no idea of what was on the other side of the berm or who was in front of us. Supposedly the advance parties from the ground Squadrons were in place but they were tangled up in the TAPline traffic jam as well. Accordingly we dug hasty fighting positions in front of the aircraft and assigned aircrews and the handful of crew chiefs we had in the advance party and waited. We had shifts on radio watch throughout the night and when not on radio watch we took turns alternating between being on watch in the fighting positions or sleeping in or near our aircraft I had radio watch from 2400-0200. I knew it was going to be dark when I got relieved so I counted the steps and noted the azimuth from our jumpToc back to my bird. I don't know if anybody has been out in the desert or someplace where there is no man made light for miles but it used to get what we called "desert dark." It was moonless and overcast night and you literally could not see your hand in front of your face. Anyway, I was relieved and followed my carefully rehearsed path back to where my aircraft was supposed to be and when I thought i was there pulled out a chemstick illuminate my last few steps so I could bed down for a few hours sleep prior to stand to. Lo and behold, nothing, no aircraft, nothing. So i walked in what I thought was a box search pattern going five more steps, looked around, made a right turn, went five steps looked around, nothing. I repeated this pattern until I had made three right turns so I should've been back where I started in theory. So I did an about face and retraced the number of steps so I could get back to the jumpTOC and try again. Well, lets just say, I never found the jumpTOC either. So I retraced my steps and expanded my search box. I came upon an OH58 with a Q on the side. Quebec was our sister attack troop so based on where they were supposed to be in the coil, I knew about where my troop should be. So I walked about 300m in that direction. Nothing. So walked another couple of hundred paces and came to a Blackhawk. Now the Blackhawks from Stetson Troop were supposed to be at the 6 o'clock position in the coil and we were at the 12 -2 o'clock position so I figured great, make a 180 walk about 1500 paces and I should be home free. After the prerequisite number of paces, I popped another chem light and looked around, nothing. I looked at my watch and it was 0500. I said to myself F it, laid down in the sand and went to sleep. I woke up 45 minutes later as it was starting to get light and found myself 500 meters outside the perimeter right in front of our gunships. I finally got back to my aircraft and asked my AO Spec L Gonzales, "Hey Gonzo, didn't you hear me stumbling around out here last night?" He says "Yeah, I saw your chemlight but when you walked by I thought you were going to take a dump or something." The next morning I figured out that what happened was that when I came upon the Q troop 58, I assumed it was facing the outside of the perimeter, but when I looked at it in the daylight, it was facing into 90 degrees off. And the Blackhawk I found which I assumed to be from Stetson Troop was actually one of the HQ Troop Hawks that was near the center of the coil and that was how I ended up outside of the perimeter. Like my wife used to say when we would get lost driving to a wedding or something, "Scout Pilot huh?" Of course this was back before we all had GPS in our phones and cars. The dark green color I've seen on Leapord 1 tanks while the black color is mostly used on All three members of the AVGP vehicle Family. Back when I was in the Army, the Canadians still had Centurions, so it's been n a while for me. I also remember this six-wheeled LABs and the single uniform for all services. I'm not from the army myself but I had a relative who served in WW2 as a Sherman tank gunner, anyway the 6 wheeled LAVs you mentioned those are the AVGP family of the vehicles Husky, Grizzly and the Couger. Yes. Even more useless than Stryker. Read several times that everybody got plenty of vehicle recovery training. I am considering building an ACR squadron using CV9040 and CV90105. Unless GH Q is gonna make the M8-120mm... Gonna include a mec h squad in CV9030. Have some other priorities, but kind of turning this over. Would really like to be able to deploy it with Marines. If course, I would like to have that expeditionary amphibious track for Marines. Need a good scout vehicle with 30in or so to go with M8s. The Brit CVRT2 is the only thing I see out there at the moment. 3 heavy ACRs with M1s and M3s and 3 medium ACRs with M8s and CVRT2s ought to be about right. Gator State will NOT EVER have an ACR using Strykers. I am also trying to figure out the best way to get back to an 11-man mec h squad. Need more infantry in mec h infantry. Currently considering 2 additional platoon vehicles - turretless M2s with 30mm remote weapons station. Reluctantly considering a follow-up Stryker company. 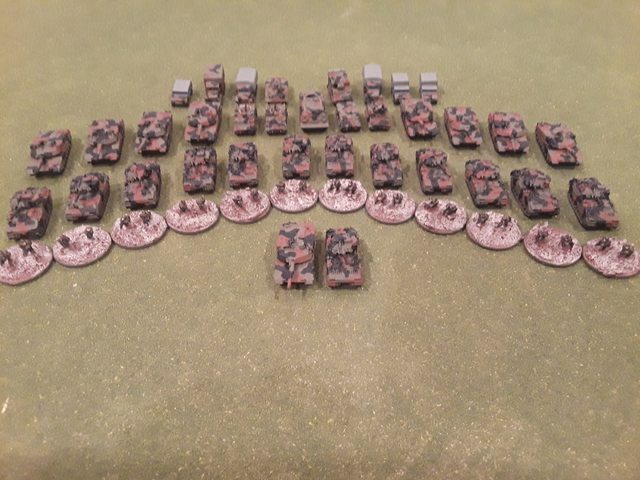 Of course, my future tank battalions, when I have finished my H and J establishments will go to 5-tank platoons, 4 line companies, 6 mortars, and tracked scout vehicles. That is a couple years off. CavDog that is too funny! We need to all get together at a bar sometime and tell stories about getting lost over a few beers! I'm going to try the BDUs again tonight and then I can post a pic of the entire complete troops. Then i will only need to do that 3 more times and then add a tank company and a howitzer battery and an HHT! And then do that 3 more times! Mech Commander, does the Canadian Army have the equivalent of armored cavalry? I know that they have armored brigades (I think) but I don't know that much about the Canadian Army and how they are organized. the CADPAT looks pretty cool, but I don't have the skill to even attempt painting it! So for an 11-man mech squad are you including the APC or IFV crew? Or are you wanting 11 dismounts per squad? I have to admit that 33 dismounts would be really cool, but that's a lot of dudes to carry. You would either need more vehicles or something big like an AMTRAC. How many troops does an MRAP carry? I have no experience with them. Dont forget an engineer platoon and an ADA platoon for each squadron. My J series squadron has a 4-vehicle platoon of SGT YORKS! I finally finished A Troop and had them rush downrange for the obligatory unit photo. The BDUs on my dismounts isn't perfect, but it's close enough for me. A troop call sign is Arapaho, but the rest of the regiment naturally calls them "Hoes" for short.